The vast majority of human history is lost to us, at least as something we can experience by proxy. For most of our existence, there were no cameras. Even after cameras were invented, decades passed during which they were too bulky and impractical to carry around all the time, unless filming things was your actual job. Sure, we have footage of World War II and Vietnam and the ’68 Democratic Convention and so forth, but it represents just a tiny sliver of what went down. (Imagine the Kennedy assassination if it happened today—instead of the Zapruder film plus three additional, barely useful home-movie angles, we’d have perhaps 100 separate recordings.) Only since the advent of smartphone cameras, less than a decade ago, has the world become a place where virtually any notable event will be recorded by everyone. Winter On Fire: Ukraine’s Fight For Freedom represents a new breed of documentary that reflects this major upheaval. Commissioned by Netflix and directed by Russian filmmaker Evgeny Afineevsky, Winter On Fire isn’t the first doc about the Euromaidan protests that took place from November 2013 to February 2014, nor necessarily even the best; Sergei Loznitsa’s Maidan, which covers similar territory, was released in the U.S. almost exactly a year ago, to rave reviews. But where Maidan focuses on the protesters themselves (emphasizing a “behind the scenes” portrait of solidarity), Winter On Fire, which employed a dozen cameras shooting constantly for three months, provides what almost literally amounts to a blow-by-blow account of the entire nightmarish showdown, assembling so much harrowing footage that one can do little but gape in horror. There’s a huge difference between seeing 20 or 30 upsetting seconds on the evening news every so often and watching a gradual descent into sheer anarchy, as it happens. That’s not to suggest that the film is non-partisan. Indeed, Afineevsky makes zero pretense of objectivity; the last few minutes, in particular, constitute such blatant pro-demonstrator propaganda that it’s a wonder nobody breaks into Les Misérables’ “Do You Hear The People Sing?” Anyone getting their information about Euromaidan solely from Winter On Fire would assume that Ukraine’s entire population favored ousting then-President Yanukovych and joining the European Union; the very existence of pro-Russian separatists in the country is completely ignored (apart from a one-sentence reference to the subsequent annexation of Crimea in the closing credits). If you seek cogent political analysis, look elsewhere. As a ground-level visual record of those 93 days, however, the film is truly astonishing, and serves as a testament that nothing like this will ever happen again without being extensively documented. 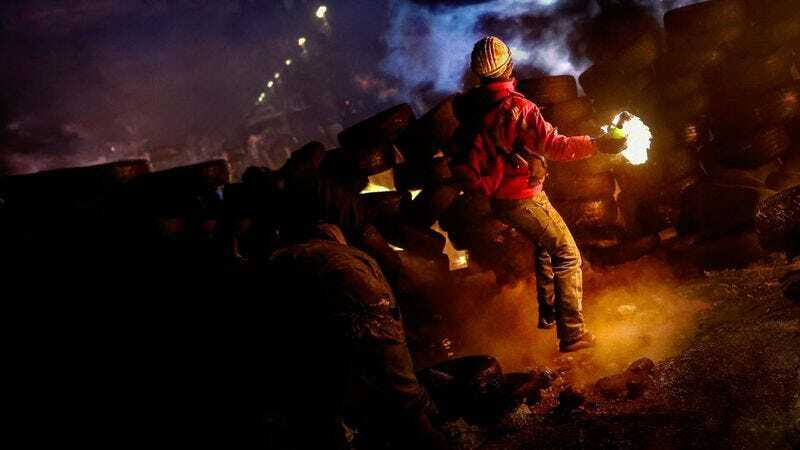 Availability: Winter On Fire: Ukraine’s Fight For Freedom is streaming on Netflix.